In “The Truman Show” – the film in which the eponymous hero comes to realise he is living in a constructed reality television show – Truman Burbank first suspects his marriage is a sham when he finds a wedding photo of his wife with her fingers crossed. The EU referendum campaign has already had me wondering more than once whether I am also living in a constructed reality television show, in Series 2 of which the rather dim Daniel Hannan MEP will become Prime Minister and the even dimmer British public will happily vote away their rights to paid holiday and maternity leave. Being in Europe has helped to deliver many of the crucial rights that underpin fairness at work. Paid holidays, maternity rights, equal treatment for the millions of people working part-time, protections for agency workers, even equal pay for women at work: all are guaranteed by Europe and all could be at risk if we left. As Paul Waugh of Huffington Post notes, “some unions (the FBU and Napo among them) are furious with Barber for teaming up with Cameron, and are writing to the TUC to complain”. Indeed, the general secretary of the FBU, Mark Wrack, used an article in Thursday’s Guardian to spell out just how “staggered” and “appalled” he is by the Barber-Cameron love-in. Rights which are unenforceable are not worth having. 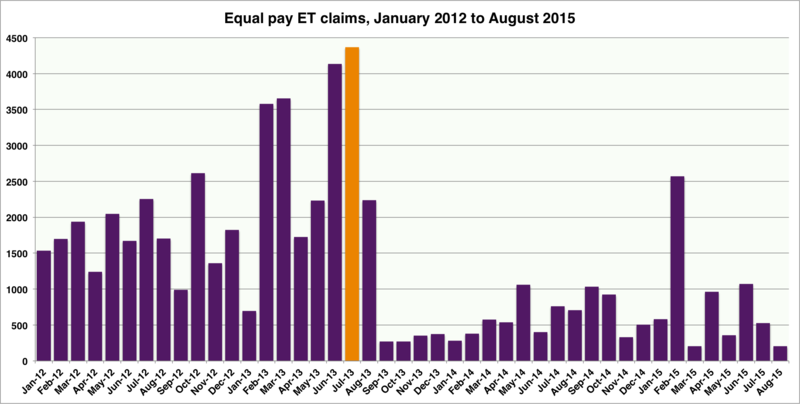 And the truth of this is clear from the following chart, which shows the drop-off in equal pay-related tribunal claims as a result of the fees introduced by the suddenly EU-derived-workplace-rights-loving Cameron and his then Liberal Democrat mates in July 2013. Over the 18 months immediately prior to the introduction of the justice-denying fees of up to £1,200 in July 2013, there were 36,898 equal pay claims. And, in the 18 months after July 2013, there were just 11,586 such claims. Even after allowing for the fact that some of the missing 25,000 equal pay claims will have been conciliated by Sir Brendan’s Acas under the early conciliation scheme introduced a year later, that is a lot more equal pay claims than would be lost as a direct result of Brexit (that being: none, at least until Prime Minister Hannan enters Downing Street and the British public says nein danke to having paid holiday and the right to equal pay). And what about the other rights that Cameron and Comrade Barber say are “guaranteed by Europe” – ‘guaranteed’ means, like, you get it whatever, yes? Well, maybe not. 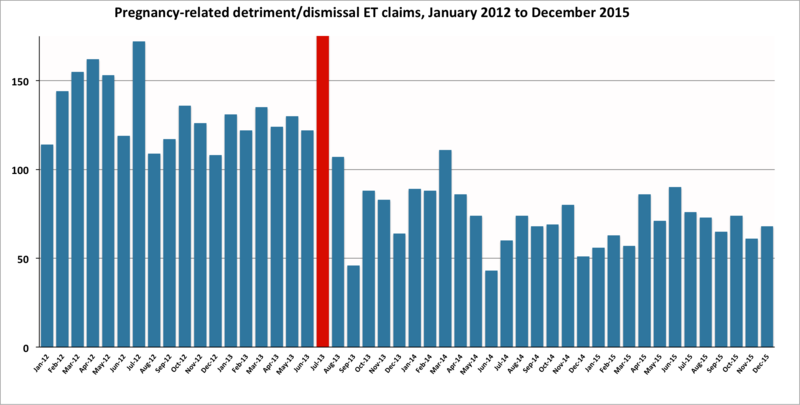 As the following chart shows, the number of pregnancy-related detriment or dismissal claims has fallen from an average of 132 per month over the 18 months prior to July 2013, to an average of just 72 per month over the 18 months after the introduction of fees. Maybe employers just stopped mistreating pregnant workers so much? I don’t think so. Indeed, the Equality & Human Rights Commission says unlawful discriminatory treatment of new and expectant mothers is currently more common than ever. Or what about equal treatment for the “millions of people working part-time”? 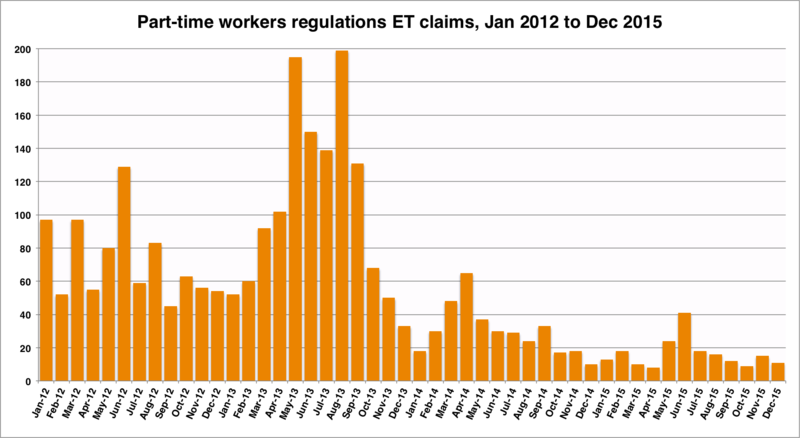 Well, as with claims for equal pay and pregnancy-related detriment, the number of part-time workers regulations claims has also fallen off a cliff since Cameron decided that unfairly treated part-time workers no longer need access to justice. In the 18 months prior to the introduction of fees there were 1,521 such claims, but in the last 18 months there were just 326 – a fall of 79%, to an average of just 18 claims per month. And, if rogue employers know that the chances of any of their mistreated part-time workers bringing an ET claim are little more than zero, that EU guarantee is – as the House of Lords select committee would say – not worth having. But, somehow, Brother Barber failed to point any of this out to his Tory co-author. I wonder why. This entry was posted in Equality, Workers' rights and tagged Acas early conciliation, Brendan Barber, David Cameron, Equal pay, ET fees, EU referendum, Paid holiday, Part-time workers regulations. Bookmark the permalink.